Frequent visitors of dannychoo.com will definitely know of chun, who is a regular member at Danny’s site. The above picture shows two of her books in my collections. The one on the left is a book on Chinese proverbs with pictures illustrated by her and the right is a comic book based on a TV series bought in 1995. 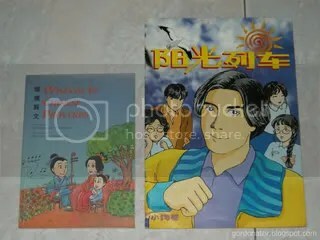 Ok I remember the book on the left, used to have it. I only knew you were famous back in the 90’s when I was still some newb kid, thanks to Gordon who told me recently lol. Next time you come back for the hols you are hereby forced to come out with us. Bring your cat and 2 hamsters. I did see a mini Blythe exhibition in Marui Young thou. btw was it only recently that you stopped signing off as xiao gou?